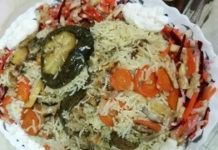 Goat all body parts including the goat meat (mutton) makes different types of delicious recipes. It is prominent for making special occasional and party menu. 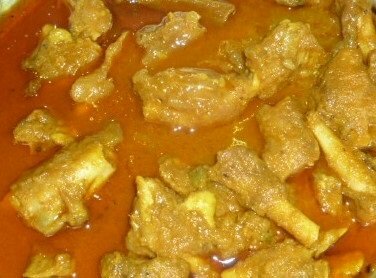 However, the process of cooking goat legs curry is different. Although, there is very less meat with the leg, its soft bones and attached fleshes and gravy made a very tasty dish that increases your demand for rice, paratha or naan-roti. Here in this recipes, the goat’s feet cooking process is discussed. 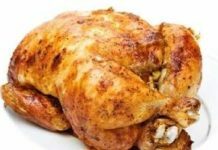 The feet need to be boiled for a considerable duration, but the time can be reduced if you cook in a pressure cooker. Cut goat feet as per your desired size. Mix goat leg, onion paste, ginger paste, garlic paste, cumin powder, coriander powder, mustard oil, chili powder, turmeric powder, hot spices powder, tamarind, and add 2 cups of hot water. Put all mixtures in a pressure cooker. Cook it for 40 minutes. Goat legs curry is ready to serve. Serve the goat legs curry with tortilla, naan, paratha or even rice. Cow legs curry one of my kids’ favorite food items. If you want to make it tastier cook it for 2 to 3 days. Cut cow feet as per your desired size. Mix cow leg, onion paste, ginger paste, garlic paste, cumin powder, coriander powder, mustard oil, chili powder, turmeric powder, cinnamon, cardamom, cloves, bay leaves, tamarind, and add 8 cups of water in a deep pan. Cook it for 3-4 hours over low heat. Cook the leg with this process for 3-4 hours for 2-3 days. When the legs become tender and the mixture is become thick then serve the curry. Serve the cow legs curry with tortilla, naan, paratha or even rice. This recipe is good with naan. 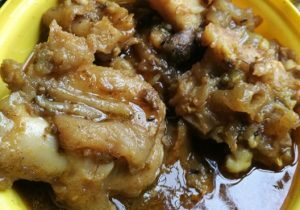 If you like my goat and cow legs curry please share my recipe with your family and friends. I love to cook and like to share my delicious food recipes with my beloved friends.